Canadian action yarn based on a popular Japanese manga. 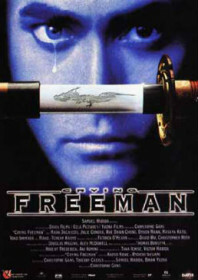 Yo (Dacascos) is an art enthusiast who is captured by a secretive Chinese crime cult named the Bond of Dragons who hypnotise him and turn him into the next ‘Freeman’; an assassin trained to annihilate Yakuza clans. Yo retains his humanity by crying after every kill and attaching himself to Emu (Condra), one of his targets, which gets him into a whole heap of trouble with his creepy boss and clinical associates. Christophe Gans is honing his talents here before his more singular achievement, Brotherhood of the Wolf, in 2001 (which also featured Mark Dacascos). There is a dependency on well-worn Asian-influenced action scenes with far too much slow motion. The style aligns closely to the manga inspiration, but the action is better in Clarence Fok’s pacy 1990 Hong Kong version, The Dragon from Russia. Studio: August Entertainment, Davis Films, Fuji Television, Toei Company, Tohokashinsha Film Co.